Lochte Feed & General Store features a new dog treat every month. 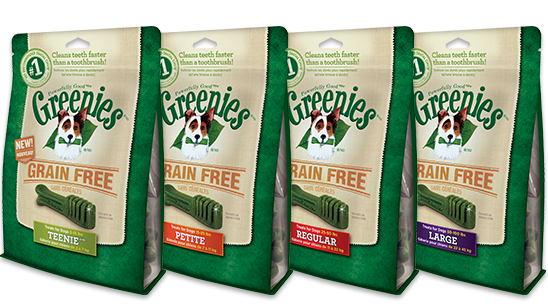 This month, Greenies Dental Chews have introduced Grain Free Greenies. Complete oral care is important for your dog’s total body health and can add years to their lifespan. These Grain Free Canine Dental Chews are proven to clean dogs’ teeth by fighting both plaque and tartar buildup, freshening breath, and maintaining healthier teeth and gums. The Grain Free Chews are formulated with chickpeas and potato for a more natural diet, making these low-fat dental chews perfect for daily treating. Come by today to offer safe, quality dog treats to your dog. This entry was posted on Tuesday, March 21st, 2017 at 3:47 pm	and is filed under News & Updates. You can follow any responses to this entry through the RSS 2.0 feed. Both comments and pings are currently closed.